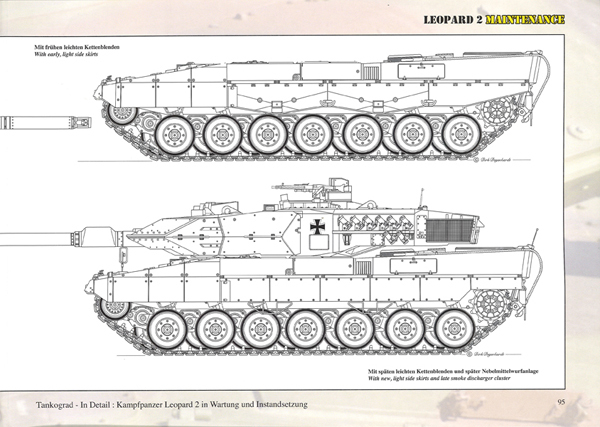 I have both standard Leopard 2 references in my stash which are written by Frank Lobitz, both published by Tankograd publishing (Jochen Vollert). 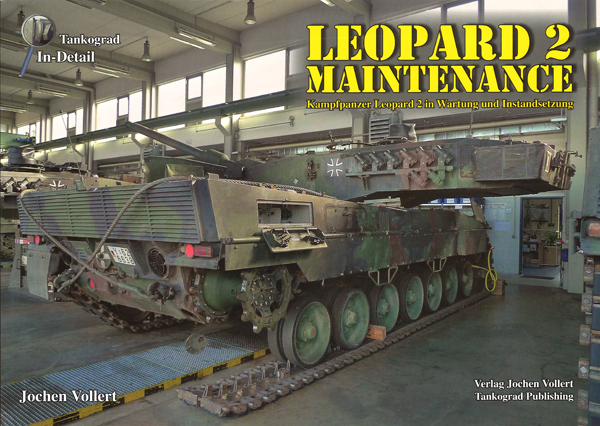 So I'm very happy to also have this current book 'Leopard 2 Maintenance' from the series 'Tankograd in detail' in my hands. This high-quality paperback offers 96 pages with 222 colour photographs of best quality. The text is available in German as well as in English. The colour prints originated in 2011 from Panzerbataillon 104 in Pfreimd, Germany, which showcases the Leopard 2A6. Introduced in the middle of the Cold War, the Leopard 2 main battle tank became the successor of the Leopard 1 MBT in 1979. From the day of its introduction, the Leopard 2's design turned out to be the milestone of post-war German tank technology. 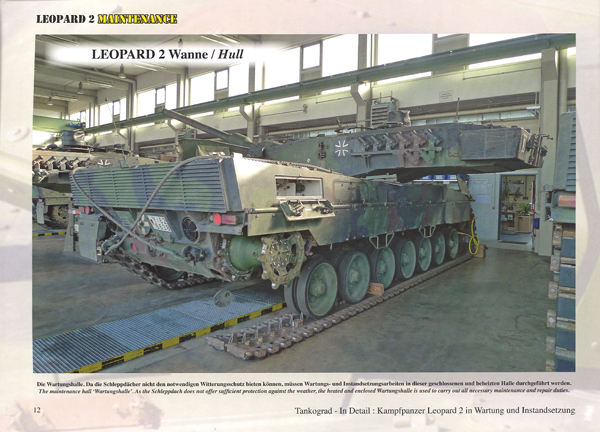 The past years and decades have seen quite a number of publications covering the Leopard 2's development, more or less detailed, illustrating the various production batches. The background of this present book is therefore not to tell a well-known story all over again, but to focus on a particular aspect and highlight a hitherto unknown degree of detail: Maintenance and Repair. This basic idea stretches through the whole publication. Against both above mentioned standard references from Frank Lobitz, this book does not devote itself to the history or the operation of the Leopard 2. 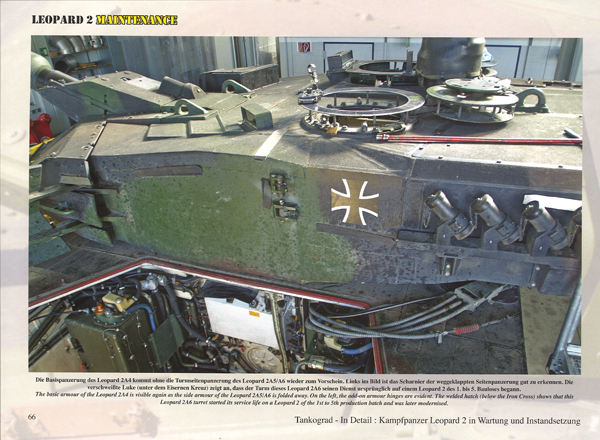 The content impressively shows many details of the MBT which are only seen during maintenance and repair. 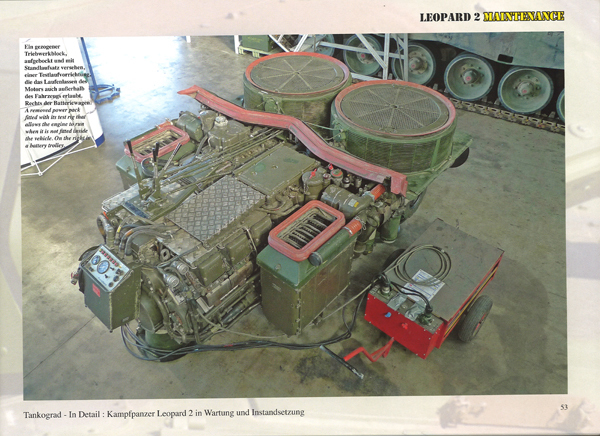 You get a classical walk-around of unusual details of the Leopard 2 which would not otherwise be accessible. The introduction of the book does describe briefly the history of the Leopard 2. Already here are explanations of maintenance intervals called "Fristen", material preservation steps and the organisation of maintenance and repair work in armoured battalions. This is followed by some general wide-angle walk-around pictures of the Leopard 2 under cover with vehicles parked under the so-called "Schleppdach" that partially protects the vehicles from sun and rain. The first chapter introduces into the hull. We are shown many details of the side-skirts, the hull rear, exhausts, tow hook, toolboxes, front skirts and much more. Details of the running gear like trailing arm, road wheels, idler wheel, drive sprocket and rubber pads are in the next chapter. The chapter on the engine deck is full of details which hidden if the turret isn't removed. With the removed turret, details of the suspension's torsion bars, the fire-extinguishing system for the engine compartment and the hull interior is presented in the chapter about the turret ring. In the next few chapters we get deep and detailed insights into the engine compartment with the powerpack removed as well as the lifting device and the powerpack itself. These are wonderful details for the modeller and their heartbeat will increase! Turret hatches, mantlet, gunner's TZF turret sight, EMES main sight (HZF), smoke dischargers and side armour are treated in the turret section. All will this is wonderfully presented on a removed turret. The next area covered in this book is an interesting one, as it looks at training aids for the crew members. 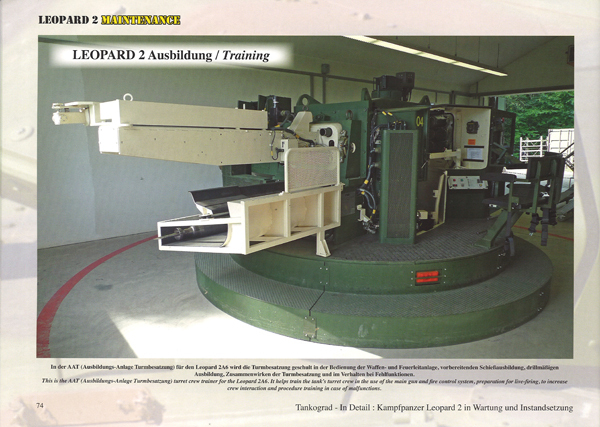 There is be a deep look at the turret trainer (AAT Ausbildungs-Anlage Turmbesatzung) and the tactical training system (AGPT Ausbildungsgerät Gefechtssimulator Panzertruppe). 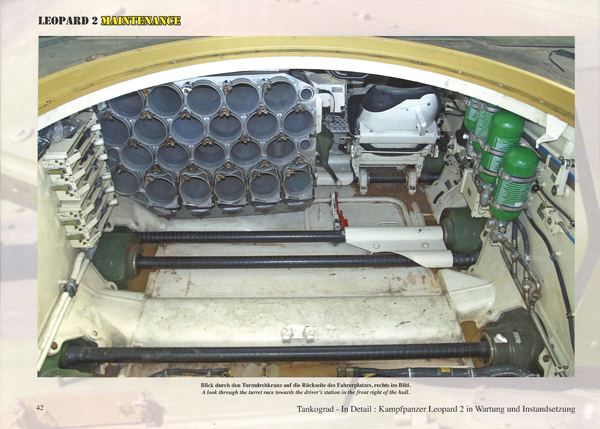 The ammunition available for the Leopard 2 is also covered. The last pictorial segment of the book looks at the service bay itself. 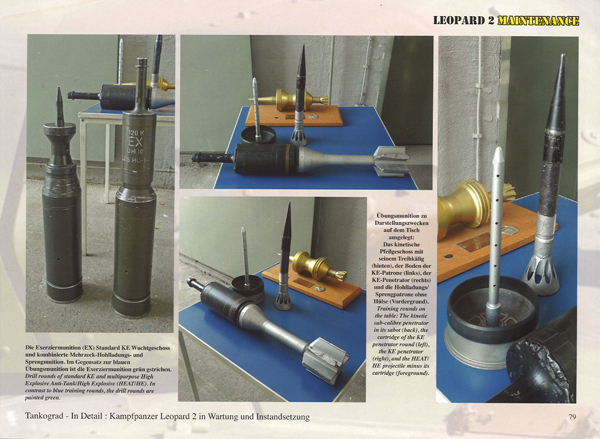 The section covers the tools used for maintenance, and the signage around the workshop specific to Leopard 2 MBTs in German military service. The last few pages of the book provide line drawings of the Leopard 2A6 in 1:35 scale; the drawings cover the front, rear, top and both sides with and without the turret attached. A successful book with an interesting topic which can be used as a reference for Leopard 2 for ambitious modellers. Even for the technically minded, there is a lot to enjoy here. Well-documented, beautiful details, excellent photos. For me this is one of the best pictorial reference books, a must-have book for anyone interested in the Leopard 2. From my viewpoint: this book is recommended without restriction!